SEA SOIL is by comparison an excellent product on today's market-a complete, living soil. Our goal as a family owned business, is to provide you with a quality product that produces a beautiful garden, organically and safely. 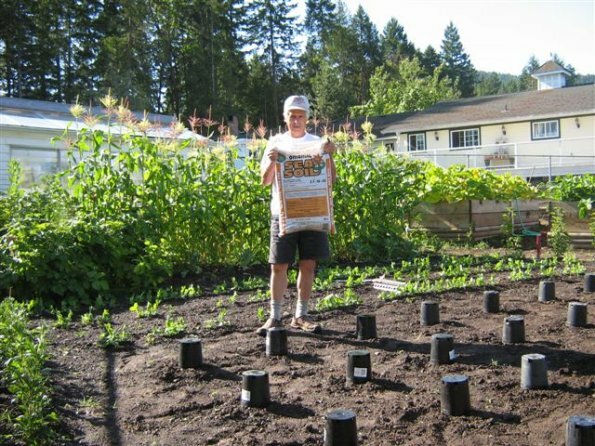 SEA SOIL is a complete soil that organically fertilizes your garden by adding nitrogen, phosphorus, potassium, micro-macro nutrients and trace elements. Our SEA SOIL bags clearly display our only two ingredients: fish and forest fines. Both are the finest ingredients available for composting today. Fish are nature's finest natural source of nitrogen and "forest fines" (an industry term for bark, forest soils, needles etc.) bring to SEA SOIL all the "good bugs" and richness from the forest. We also add aged forest "fines" to our product, which have been composting at 60 degrees C. for a minimum of ten years. These aged "fines" are rich in themselves, providing our product not only with that dark rich color, but with potassium and phosphorus. Bark waste, mainly hemlock and fir, from Canadian Forest Products Dry Land Sort (dry land indicating no salt water soaked logs) located near Port McNeill on northern Vancouver Island, is loaded into a large trommel-screen, where the fines are removed through the screening process and then transported to our site where they are mixed with the fish in our unique mixing process ensuring the saturation of each piece of bark. After a five week process of monitoring and mixing to the correct ratio, the compost is moved to windrows where it is again monitored and turned when necessary, composting for a period of two years at 60 degrees C. After a cooling off period, it is screened and placed in bags. SEA SOIL does NOT contain any ground-up white wood, hog fuel, wood by-products or land clearing debris. OK - So, I just went to the store and saw 3 other products that say "Fish & Forest Fines" - so what's the difference with yours? SEA SOIL does NOT contain any ground-up white wood, hog fuel, wood by-products or land clearing debris. Wood is not a good option as a carbon base in compost as it generally requires a minimum of two years to break down and will eventually rob your plants of valuable nitrogen to complete that process. Ground-up wood also produces slivers in compost which can be painful to gardeners. (SEA SOIL has a wonderful texture.) Wood by-products can include wooden shipping pallets, building materials etc., some of which have been treated with hydrocarbons, preservatives and paints-chemicals which will not be removed during the compost process. We do NOT add any mill or sewer sludge or bio-solids to our product. These products contain a high factor of heavy metal contamination, especially mercury. Mercury is accumulative as it is not water soluble and will therefore not wash out of your soil. This is particularly a concern in vegetable gardens where veggies, especially those grown underground (i.e. potatoes and carrots etc. ), will absorb the mercury. Mercury is especially dangerous to small children and seniors. SEA SOIL is chemical free therefore we do NOT accept any manures, yard or landfill wastes as they often contain pesticides, herbicides and fertilizers utilized by homeowners and in animal feed. These chemicals are not removed during the composting process and will remain in the compost you purchase. We do NOT add any sand or fillers to enhance our volumes. Many of the soil products on the market are simply screened excavation soils (much like what is already in your garden} to which manures, composts etc. are added to become expensive "special blends". SEA SOIL is a pure product, only fish and forest fines, chock full of nutrients and living organisms. It can be utilized "as is" or mixed into your garden to build up your present soil. It is truly "gardening made easy".